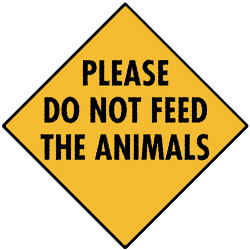 Michael D W Richards presents an interesting article on the need to standardize zoo signage, particularly DO NOT FEED signs. He concludes, “To achieve this goal they should utilise a design which is reliant on both imagery and text to convey a message, with imagery at the forefront of the design. A human hand, an item of food and an image of an animal should be displayed. … When imagery and text is displayed on feeding restriction signs, all visitors benefit. This form of provision should not be seen as excessively catering for the needs of marginal groups. Rather it should be viewed as an approach that represents a heterogeneous society, increasing access to information and enjoyment for all, through engaging signage.” This article is a part of a series about zoo accessibility.